I was psyched to play The Deck I Said I’d Never Build, and foolishly kept a two land hand. I was able to cast a Ring of Valkas, but I didn’t drop a 3rd land until turn four, and my fourth land drop, on turn 8, was a Temple of the False God. Other stuff happened while I didn’t get to play. Grimgrin counterd a Rhystic Study. Phenax played a starfish and a Withered Wretch, and an Undead Alchemist. This mostly meant that I had a small library and most of my creatures were removed from the game. Phenax Traumatized Grimgrin, to suprisingly little effect. Sidsi played a Tombstone Stairwell (which actually gave me something to sac to my Phyrexian Vault to draw said Temple). Grimrgin got out an Avatar of Woe and Geth. Then the game turned into a pretty long drawn out mill battle between Sidisi and Phenax. Grimmy stole my Ob Nixilis the Fallen with Geth… making me mill 5 cards, 4 of which were lands… dumb. Someone won. It was not me. Kaalia was always one of those generals I said I’d never build: too autopilot, too abuseable, tough to be creative with. Then one day I decided it would be fun If I had very little idea of what creatures were in the deck. Now the deck is 45 mana sources, 15 spells or artifacts that give haste, extra attacks or non-broken buffs to Kaalia, and a huge stack of almost 100 Demons, Angels and Dragons. Each game I shuffle and pull out 40 random creatures and shuffle them in to the deck. If I swing with Kaalia, I let my opponent pull a random creature from my hand. It seems like a fair way to do it. I started the game with a three land hand, none of which produced colored mana (Sunhome, Slayer’s Stronghold, Cathedral of War). I kept it anyway and drew… Rogue’s Passage. By turn 6 I also had a mountain and a plains, but no blue. Baru had a Sylvan Library, Chameleon Colossus and was doing pretty well. Zegana was ramping and had a Psychosis Crawler. Baru hit 8 permanents on a Genesis Wave for 8 and was looking very strong. I cast narset and swung into Zeganna, who did not block with a 4/4 Psychosis Crawler (thanks First Strike and Exalted). I got a Beacon of Tomorrows. On the extra turn I got two extra attacks, and I Long-Term Plans-ed for Alpha Brawl (to take care of Baru’s board) but didn’t notice that Baru had an Altar of Dementia, so it got milled away (grrrrr….). I had Divine Reckoning in hand to take care of Baru’s board when he was going to pop Nissa Worldwaker’s ultimate, but instead he just used Overrun via Garruk and smashed us. Narset stood out to me as the most fun of the new Khans. My deck isn’t super original (I faced a similar one last week). Narset’s the only creature (other than kobold, Keyrune or Tatsumasa tokens). I tried to limit the number of Extra Turn spells, only playing Beacon of Tomorrows, but I do like Extra attacks a lot. Hedron Matrix is a favorite choice because it’s The Matrix, and Narset is Keanu. The other goal is to get all three in-color “Dragon” enchantments on her to make her a Serra Lightning Angel Dragon (4/4 Flying Vigilance, Haste, Firebreathing). Reconnaissance is gold in this deck too. We played another game with Balthor that got long and grindy. I played Marath, and had lots of opportunities and good draws, but kept getting foiled by Patron of the Moon and Roil Elemental. Patron eventually won. Then I played Teysa #3, but Balthor rolled us over. vs. Captain Sisay; Patron of the Moon; Oloro, Ageless Ascetic; Balthor. Grenzo was the second deck that I built this summer that hadn’t gotten a proper multiplayer game. I played Grenzo early on and used his ability early, missing at first. Sisay kept building up with things like Heroes Podium, Azusa, Umezawa’s Jitte and Rofellos (who hadn’t been banned yet). Patron had a Homarid Spawning Bed and Meloku on the board. I managed to Grenzo in a few things and was able to use Tel-Jilad Stylus to recur things like Mindclaw Shaman or Nekrataal, missing once trying to get something from Oloro, and then getting a Tutor from Balthor. 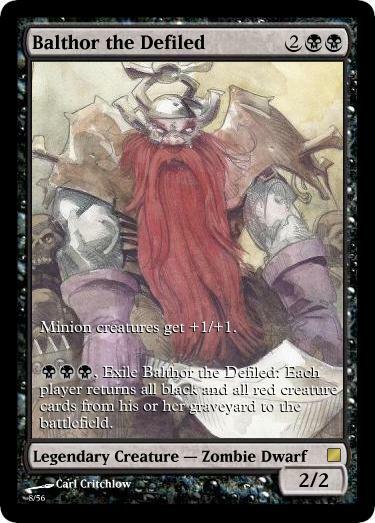 However, Balthor popped and it led to us all dying. I read online somewhere about the idea of using Grenzo to cheat out small guys, rather than using his variable cost to try to cheat out bigger guys. I thought that sounded fun, so I restricted myself to creatures with 2 or less printed power, meaning Grenzo would always hit if it were a creature. I considered going all-creature, but it was too tempting to pass up things like Reito Lantern, Tel-Jilad Stylus and so on to be able to control what is on the bottom of the library. There are a number of fun cards like Epochrasite that end up being bigger than 2 power when they come in. Despite being heavily creatures, it still tends to whiff a lot, but I like playing it. It’s also nice that the X in Grenzo’s cost means he could just be a beatstick if you need him to be. Also, it makes me think of David Schwimmer’s character “Greenzo” on 30-Rock. I broke out Teysa #1 for a game and lucked into a turn 5 combo win by having Phyrexian Altar out and using Puppeteer Clique to steal Balthor’s Mikaeus and something else. I was able to play out my hand and tutor for a Blasting Station to use with Persist/Undying shenanigans.